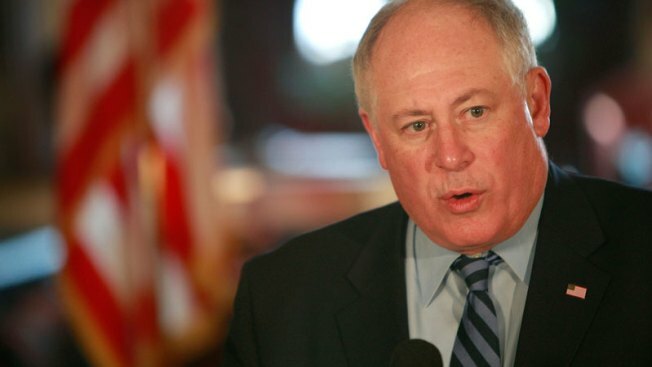 Illinois Governor Pat Quinn urged Roland Burris to "do the right thing" and step down. Gov. Pat Quinn said Friday that Sen. Roland Burris should "do the right thing," by putting the people's interest first and resigning. In a news conference, Quinn laid out his plan for special elections for future Senate vacancies. He still favors "temporary appointments" by the sitting governor. If Quinn had to choose a temporary replacement, he said he would appoint someone who has no interest in running for the office, according to CapitolFax. Quinn said Burris' decision to accept Gov. Rod Blagojevich's appointment was "a mistake," noting that Burris, whom he called a good friend, now "has a cloud over his head." "He's a good man, I believe that on reflection ... he will do the right thing and resign," Quinn said. The governor said he had not spoken to Burris about this before the news conference. Burris was appointed by former Gov. Rod Blagojevich, who was later impeached and removed from office. Burris initially said there was no discussion of him doing any favors in exchange for the appointment. At a White House news conference Friday afternoon, Press Secretary Robert Gibbs said Burris should take this weekend to "think about his future." While he would not say if Burris should resign -- he said the people of Illinois have been through a lot already. Others have asked the senator to step down or have voiced their support of a special election to replace him. In a statement released Wednesday, Rep. Jan Schakowsky, who has been named as a possible replacement for Burris in the next election, said that regardless of whether or not Roland Burris chooses to resign, the 17th Amendment allows the Governor the "right to end the temporary term at any time and call for a special election ...l the best way to put credibility back into the process is through a special election." Moments after Quinn's public statement on Friday, State Treasurer Alexi Giannoulias released a statement urging a Burris resignation. Giannoulias said, "The situation has become toxic and only serves as a sideshow during a time when lawmakers should be addressing the financial crisis that is impacting families across Illinois." Chicago Mayor Richard Daley clearly doesn't want to get involved in the ongoing debate, the Chicago Tribune reported today. Daley told reporters Thursday that Burris has to explain -- but he wouldn't elaborate on what Burris should explain about. Nor will he say if he thinks Burris should resign the post he's held just a few weeks. He says Burris has to figure that out for himself. Daley did say Burris has thus far been an effective representative of the state of Illinois because he voted in favor of Obama's economic stimulus plan.